When you read this letter, it will, most likely, be a very difficult time in your life. You are considering the best plan for your child you love. We understand this is a very difficult and important decision. We believe no one but you, knows what’s right for your child. We admire your considering adoption for your child as one of your possible choices. Thank you very much for giving us the opportunity to introduce ourselves. 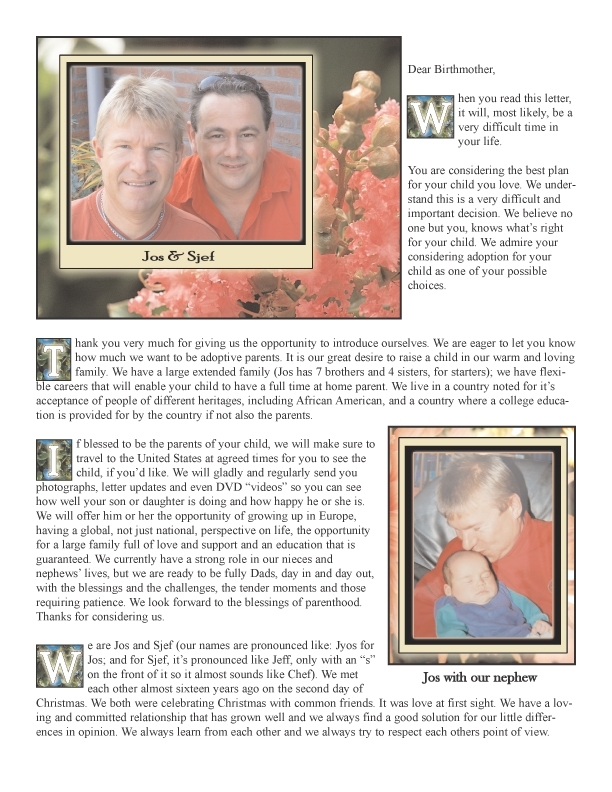 We are eager to let you know how much we want to be adoptive parents. It is our great desire to raise a child in our warm and loving family. We have a large extended family (Jos has 7 brothers and 4 sisters, for starters); we have flexible careers that will enable your child to have a full time at home parent. We live in a country noted for it’s acceptance of people of different heritages, including African American, and a country where a college education is provided for by the country if not also the parents. If blessed to be the parents of your child, we will make sure to travel to the United States at agreed times for you to see the child, if you’d like. We will gladly and regularly send you photographs, letter updates and even DVD “videos” so you can see how well your son or daughter is doing and how happy he or she is. We will offer him or her the opportunity of growing up in Europe, having a global, not just national, perspective on life, the opportunity for a large family full of love and support and an education that is guaranteed. We currently have a strong role in our nieces and nephews’ lives, but we are ready to be fully Dads, day in and day out, with the blessings and the challenges, the tender moments and those requiring patience. We look forward to the blessings of parenthood. Thanks for considering us. We are Jos and Sjef (our names are pronounced like: Jyos for Jos; and for Sjef, it’s pronounced like Jeff, only with an “s” on the front of it so it almost sounds like Chef). We met each other almost sixteen years ago on the second day of Christmas. We both were celebrating Christmas with common friends. It was love at first sight. We have a loving and committed relationship that has grown well and we always find a good solution for our little differences in opinion. We always learn from each other and we always try to respect each others point of view. In the Netherlands, our laws respect everyone and so we are allowed to marry. Our wedding was a great experience and a wonderful day which we celebrated with our large and loving family and friends. Everyone was very enthusiastic and we were overwhelmed by their warmth and friendship. After this, we felt it was the right time to start a family, so we started to look at our options for realizing our dream. One of our first steps toward parenthood was the pleasant agreement that Sjef will be a full time at home dad. He is very excited about being an at home dad. We are both pleased to be able to have him home full time for the child. Until a child joins our family, Sjef will continue his work as a professional baker. The bakery for which he works makes handmade high quality guaranteed breads, pastries and sweet chocolates. Sjef is looking forward to being a fulltime stay at home dad and perhaps sharing his cooking skills with our child in the kitchen at home. Sjef also loves to garden; our garden looks magnificent. In his spare time Sjef loves to read a good book, he likes the most true stories and thrillers. As Sjef is an avid reader, he also looks forward to reading children’s books with our child and helping our child to learn to read as well. For over four years, Sjef has enjoyed picking up his nephew Giel and niece Eva at school on Mondays and Tuesdays. They are in elementary school. We are very close with them. Sjef brings them to the athletic club for fun or helps them with their homework. They also like to go to a park near our house to play with the other children in our neighbourhood. Every Tuesday they make dinner together and we eat as a family. Sjef is a good cook and he likes to invite family or friends for dinner. We look forward to having meals with our child and our extended family; we want him or her to grow up with the sweet smells of home cooking. We are fortunate that Jos has an established position as an accountant in a company which also has the flexibility of a family oriented business. He will be able to adjust his hours so that he can do some of his work at home (after our child is asleep) so that he can spend more time with our child. Jos enjoys his work as the lead administrator of a building company in Amsterdam. His work involves giving guidance to the staff of the financial administration and the office secretariat. He also has to deal with the legal side of the industry. Part of his work involves making recommendations for the direction and management of the company. He shares his skills with family as well; at home he is known to help family and friends with their income tax forms and other financial things like mortgages. For relaxation he likes to run a few miles and he likes to read books. Another hobby is singing. He has a musical family; they all like to sing at family and social occasions. When he was young, Jos sang songs at school and with his brothers and sisters; some of them play the guitar or piano. After he grew up, he became a bass and has had singing-lessons for several years. His favourite songs are Christmas-songs. For several years, he appeared in a Charles Dickens Choir. He looks forward to singing lullabies when he brings our child to bed. Our child will also be a part of a nice and big extended family; As we already mentioned, Jos has seven brothers and four sisters and Sjef has one brother and one sister. Most of our brothers and sisters are married and have children. There are 29 nieces and nephews. Our family looks forward to have a new niece or nephew and will give him or her a very warm welcome. Our brothers and sisters are enthusiastic about “being there” for us and our child as we have all been helpful to each other over the years. We also have many friends and most of them are married and have children. The celebrations of our birthdays are a very busy and joyous time. We both are blessed with loving and good caring parents. They give us the love and security we need, they are very supportive of our plans to become parents. There are certain values that we were raised with that we will pass on to our child. We believe strongly that it’s important to raise a child to have compassion for others who may have different circumstances. He or she will be raised to be kind and thoughtful and to realize that they are growing up in a community where everyone is doing their part to help others. Our parents are delighted to become a grandfather and grandmother again. They obviously are thrilled to have such a large family and welcome each grandchild with individual enthusiasm. Sjef his father and mother like to go to the beach with the family. Granddad brings his metal-detector there to search for treasures with the children. It is nice to see their excitement for every little penny they find. They are also very active in visiting the children’s school presentations and supporting them in whatever sports they like to play. They will do anything to help and support our child to grow up to be a strong, confident, warm and loving person. But most of all they will love the child for who he or she is as an individual with his-her own view of the world, interest, talents and dreams. We live in a beautiful, old historic small city in the north of the Netherlands. It is a multiracial liberal country with high standards and values. Our small city is a nice place to live, with all the facilities a child needs. There are several schools within five minutes walk from home. We have a library and all kinds of sporting clubs and a great swimming pool where the children come to learn how to swim. There is a creative arts club where children can learn pottery, carpentry, theatre and dance. About four years ago, in anticipation of our plan to be parents, we bought a home which has four bedrooms and lots of room to play in. The house has many great windows and the sun can shine in the whole day, so it is a very light and warm house. It feels comfortable to live here. We have a nice kitchen and a cozy living, upstairs there are 4 bedrooms and a bathroom. We like to decorate our home in natural colours and materials. In our home Christmas and the turning of the year are major events filled with activities with our family and friends. The whole house is nicely decorated, we eat holiday foods and we all hope Santa has left something for us. In the Netherlands children attend a warm, friendly and easy going nursery school program. Elementary school follows. When they are 12 years old, every child receives secondary education. After secondary school there is a possibility to study on a university. We’ve already established a savings account which can be used for college; we want you to be assured that your child will have every opportunity for a college education. In addition, our country values education strongly. Our government provides scholarship assistance to help students attend college when additional resources are needed. So everyone has the opportunity to go to college if they want to. We feel it is very important the child gets every opportunity to develop and grow in the direction of their heartfelt interests. We look forward to giving our children an education in our home community and also the opportunity to learn about the larger world. They will certainly learn about and visit the United States, the state where they were born and where you live, as well as about the history and culture of America. We have been lucky enough to visit many countries and hope, when our children are old enough to appreciate this, to share the experience of seeing other countries as well. We enjoy seeing both the “sights” and also having the opportunity to meet and know people, who live, day in and day out, in other cultures. In the past, we have travelled to countries such as Kenya, Gambia, Senegal, Greece, Cyprus, Portugal, France, Germany, Switzerland, Turkey, Canada, Mexico, Egypt, Malaysia, Indonesia and Sri-Lanka. We have seen a lot of culture, nature and many different and beautiful people. We believe that children primarily enjoy being at home enjoying the simple pleasures of day to day life, but, to the extent that travelling will be appropriate at some point, we want you to know they’ll have that opportunity. Even before a child joins our family, we have noticed our deepening appreciation of spending time at home. Gardening, cooking and reading about adoption. On the weekends, we spend some time in our little weekend home which is a small house on a vacation park not far from the beach. We look forward to sharing warm and fun home time with the child who we will be blessed to parent. As we dream about becoming parents, we look forward to telling our child a little bedtime story, and listening to them giggle as they run around the house playing with their friends. When we are lucky and become adoptive parents we raise our child in love and respect for them selves and for others. We shall help them to develop and to become who they want to be. We will be grateful for the opportunity to do that. As we said at the beginning, we are willing to stay in touch over the years, connecting both in person (in the States) and with photographs and letter updates. We want you to feel reassured that adoption was a good choice and that your child is happy and thriving in our care. If you would like more information please feel free to contact Full Circle Adoptions, Toll free 1-800-452-3678. We look forward to hopefully talking with you soon.